Well, okay, they do, but not in the way you think. This was a hard lesson for me to learn as a young hard-charging triathlete when my ego and self-esteem were very attached to my results. Of course in triathlon or any sort of distance racing courses vary, competition varies, conditions change, terrain can be significantly different, and even set distances can vary. Comparing times can, at least to some degree, be meaningless. Yet, the questions and comparisons persist. We continue to evaluate and compare our results. We are hard on ourselves, and others are hard on us too, whether they know it or not. The binary evaluative process either makes a result a negative, or puts pressure on us to meet some arbitrary standard. In addition to that, at some point as we age we are fighting a battle against consistently descending performance. The result is that many athletes are frustrated and actually impacted negatively as they age even though they should be thankful for their health and fitness. The outcomes of this negative psychology include turning to performance enhancing substances that produce adverse health consequences. Ironically, 99 percent of all of us competing in triathlons are doing this voluntarily, for recreation, and as part of our lifestyle. Yet, we still allow that clock to define us. It takes a bit more maturity to learn that winning really has nothing to do with your time or what’s on the scoreboard. There is always somebody better or faster. Winning, however, does have everything to do with giving your best every day. Your best at work, your best to your family, your best spiritually and to your community, and of course doing the best you can on race day. It took me many years to realize that the people that really love you and support you really do not particularly care with your result on race day. What they care about is you, and if you are happy and satisfied then they are happy for you. Many times, your loved ones don’t even know what your place or time is. They just care about you. They care about you as a person, not your time, your place, your trophies won, or your podium finishes. Just you. Doctor Kelly Crace at the College of William and Mary is the Vice President for Health and Wellness. Dr. Crace has renowned expertise in performance psychology and has ongoing betterment sessions for students on “authentic excellence”. Dr. Crace demonstrates how the constant evaluative process can create an ongoing negative psychology that limits performance, and then therefore limits fulfillment and satisfaction. Once we remove ourselves from the evaluative gauntlet we are then free to perform even better. As proof of his work, the very demanding academic atmosphere at the College of William and Mary has produced the No. 1 ranked school in the nation in student happiness. Perhaps the pursuit of authentic excellence is working. Likewise, Professor Morten Hansen in his books Great at Work and Great by Choice describes how individual comparisons limit performance and have a negative psychological impact. Conversely, establishing a framework for ongoing betterment, improvement, and consistently pursuing excellence creates an atmosphere for higher performance. More importantly, it also provides a framework for higher levels of fulfillment and satisfaction in life. Don’t get me wrong – I still want to perform the best I can. Just remember, this is supposed to be fun. It is supposed to build a healthy fitness lifestyle. It encourages positive relationships and transfers to performance in other aspects of life too. Just remember, whether internally or externally generated, we don’t want our pleasure passion to become a negative due to an oppressive evaluative process. I have pledged to always be happy, no matter the result (although I’d still like the result to happen as quickly as possible). So, do they really care? Of course they care…they care about you! Do you have it? Do you get up in the morning and get after it? Every day? Do you take advantage of this free yet priceless competitive advantage? As athletes, we probably think we were born to hustle…but do we really do it? Michael works down at the street corner selling newspapers. He is not as privileged as most of us. He works harder than most, and probably receives relatively little pay. He is up early every morning, very animated, and cheery. His shirt this morning said “Hustle Everyday.” Michael’s got it, and he is certainly further ahead than if he didn’t have it. He is a mentor and hero to me. Are you like Michael? Hustle is a differentiator. It is a competitive advantage that can take an average person and make them great. Hustle creates a positive can-do attitude that is visible and gets things done. Hustle is contagious and makes those around you better. All of your talents are enhanced when you learn how to hustle. Hustle doesn’t have excuses. Hustle just keeps going. Hustle can fill you will passion and a desire to get things done. Make hustle a habit. Don’t get me wrong, hustle isn’t easy. And, it’s not for everyone. Of course, for those that do this is good news because hustlers are already ahead. Hustle takes energy. Energy therefore is a decision. Adopt a healthy fitness lifestyle that gives you the energy to hustle. I was laughing with my swim buddy this morning as we were about ready to dive in the pool at 4:45 this morning. We joked that we are two average guys who are already ahead of the competition because they are still sleeping while we are rolling. The competition may be smarter and more talented, but while they are sleeping we are already after it. And, we’ll be right back at it tomorrow, and the day after that, and so on. You can’t stop a hustler! Hustlers have dreams, and those dreams are what makes them hustle. Hustle is the action that pursues the dreams. Without the hustle, dreams are just wishful thinking. The hustle is the constant movement toward your goals. Fuel your hustle with passion toward a worthy goal – even if you have conjure up the passion to get it going. Fire up your passion and let’s get after it! Hustle is the opposite of complacency, and complacency is epidemic all around us. If you don’t have hustle, find someone who does and try to “catch it.” Create a mentality that always has you hustling towards worthy goals. Then, renew it every day. Let’s get going! Come on, you can do it…let’s go! Constant improvement to be better. Betterment. It seems like I preach it all the time to other athletes and around the office. My mantra, and you have seen it before many times, is “Consistent effort over time toward a worthy goal always produces positive results . . . every day, every day, every day!” But, does it really happen? Do we really do it? It has been my amazing privilege to compete in the most iconic ultra-distance triathlon in the world in Roth, Germany eight times. What amazes me, is that as good as it is, and, as glowing as my memories are, it seems to be even better every time. Challenge Roth has an amazing history. The latest addition was the 35th anniversary. I fell in love with the race, the people, and the area the first time I was there in 1989, and this last time made my eighth finish on that magical course. From a developmental and a business perspective, the question is how this does all happen. Certainly Challenge Roth is the underdog on the world triathlon stage to the dominant race producer, Ironman. In fact, prior to 2002 Challenge Roth was part of the Ironman family. At the time of transition, Herbert Walchshoefer ushered Challenge Roth as an independent race on the world stage. After Herbert’s untimely death in 2007, his son Felix, along with his sister and mother, took over leadership of the race and organization. Felix was just 9 years old, I believe, when I first met him tagging along with his father. It is amazing to continue to reunite with him over the years and watch the race continue to improve. After each addition of the race, Felix goes back through every aspect to look for areas in which the race can be improved and the athlete experience bettered. His obvious love for the athletes, volunteers, and community exudes in all he does. The race experience in Roth, Germany is like no other. Close to 300,000 spectators, 7,000 volunteers, and the villages and surrounding areas that embrace the athletes and every aspect of the event. Of course most of us only see the actual race festivities and not the behind the scenes the other 11½ months it takes to make the event truly iconic and one of a kind. Each year Felix and team review the race looking for areas to improve and make it even better – better for the athletes, family, friends, and the entire community. The course, the aid stations, the 80 draft marshals on motorcycles, the post-race food, and even the post-race foot soaks in healing salts that include a calf rub are all results of the ongoing betterment plan. Foot soak and calf rub! 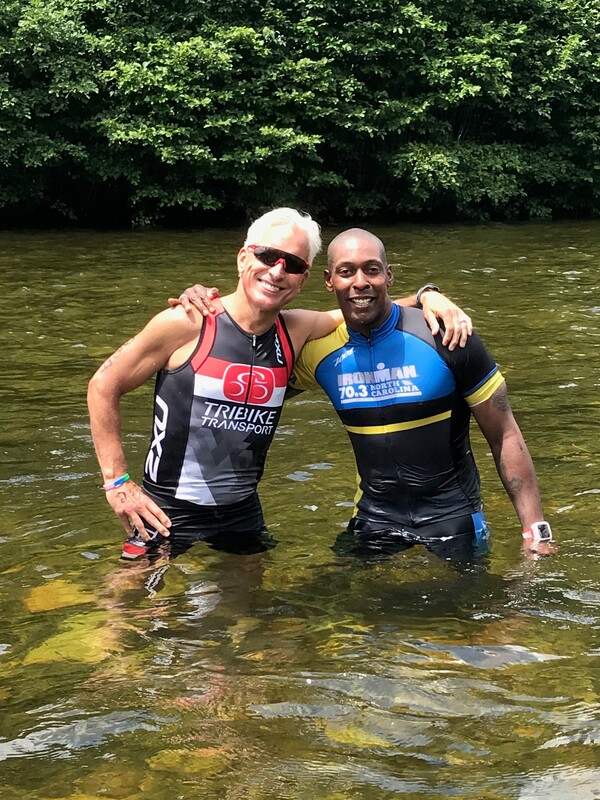 It has been my pleasure to consider Felix a friend, a mentor, and a shining beacon for all the positive aspects of triathlon. Of course, as a friend recently reminded me, I can be prone to only see the positives and throw in a bit of hyperbole, to which I plead guilty. However, when it comes to Felix, the Walchshoefer family, and the race organization I believe the praise and hyperbole are 100 percent appropriate. They are an example to me that yes, we really can focus on continual improvement so that we are always becoming a better version of who we are. Many thanks to the Challenge Family – I can’t wait to return! Winston-Salem, North Carolina April 2018: The winners of the 2018 Forsyth County Governor’s Volunteer Awards were announced Wednesday, April 25th, 2018 during a breakfast for those nominated. David Daggett, attorney and partner with the law firm Daggett Shuler in Winston-Salem, NC, was proud to accept the 2018 Forsyth County Governor’s Volunteer Service Award in the People’s Choice category. North Carolina Governor Roy Cooper has a large focus on and support for volunteers who make a difference. This is the 39th year that these awards have been awarded by the governor of the state of North Carolina. The awards recognize individuals, groups, and businesses who make significant contributions to their communities through volunteerism and community service. In Forsyth County the awards are managed by HandsOn Northwest North Carolina. 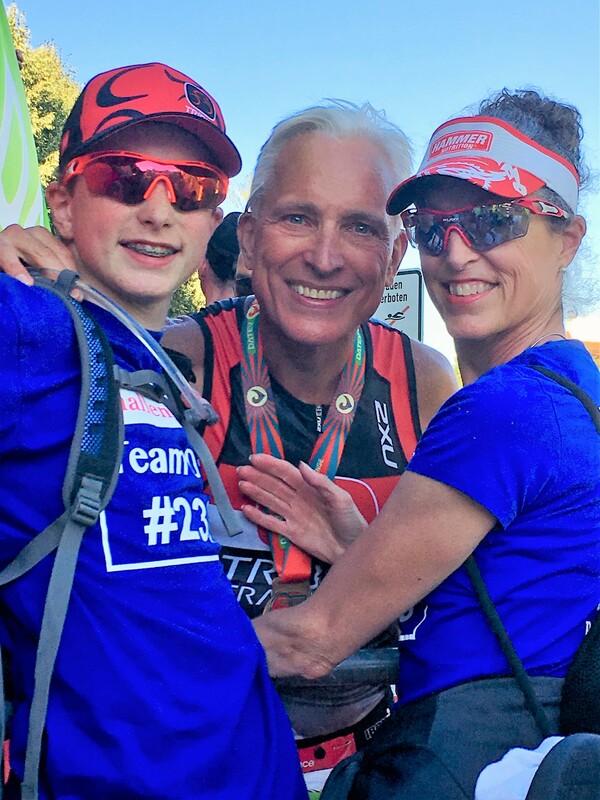 Business owner, attorney, father, and Ironman competitor David Daggett was nominated by the Piedmont Down Syndrome Support Network (PDSSN) for this prestigious award. Mr. Daggett has worked with PDSSN for many years. This important nonprofit organization provides support and information to parents of children and adults with Down syndrome in the Piedmont Triad area. In his awards speech Daggett emphasized the inclusion, acceptance, and love demonstrated by the Down syndrome community. Moved to tears, Daggett recalled a special interaction and a hug from a little girl in that community. As a 2018 Governor’s Volunteer Service Award recipient David Daggett is grateful for the support from the community and colleagues. He is excited to continue volunteering with organizations like the Piedmont Down Syndrome Support Network. Further, he encouraged all individuals in attendance to be ambassadors of love in our community. David Daggett is known throughout the Triad as a leader in the community not only with his law firm Daggett Shuler, but as the co-founder of the long running Safe Sober Prom Night initiative. “Making a difference in the lives of our youth, and in the people who need us the most should be the most natural gift of giving. I urge everyone to get involved, pick a charity, an organization, and help make a difference,” Daggett said. “He must be crazy” the younger guys observe. “How does he keep doing it after all these years?” They were talking about me swimming in the same pool every weekday morning for more than 30 years. I have previously talked about integrating our training into all aspects of our lives to enhance everything we do. I use the daily routines of swimming in the morning, running most days at lunch, and long bike rides on the weekends as a slight edge (a topic of a future article) and a professional competitive advantage. In his book Spark author John Ratey, MD, basically reviews how exercise, particularly first thing in the morning, can enhance every aspect of our lives including health, academic performance, and occupational success. The good news is that if you are disciplined enough to make this exercise part of your daily routine you beat 90-plus percent of the competition from the very beginning because they simply won’t do it. That’s a slight edge. So, you ask how does he do it? Doesn’t it get boring? Believe me, my attention span is as short as anyone’s. However, I have developed a three-step trick that helps me get through the workouts and enhances the other aspects of my life. Of course, the daily swim is for fitness and to prepare for competition. I swim by time, not by distance, and it is largely unstructured. However, I have had successes over the years including several first out of the water awards at Ironman™ events. My three-step routine is actually very simple and includes 1) spending time in meditation/prayer/being grateful, 2) outline my day/morning/afternoon in bullet points, and 3) troubleshoot whatever is my biggest issue/problem/etc. that I am facing. First, spending time in meditation, prayer, and being grateful is positive for your personal psychological health and helps enhance your interpersonal relationships, spiritual connection, and occupational attitude all while engaging in a positive fitness activity. I joke that I like doing this while I swim because nobody can interrupt me. Next, I spend time outlining in bullet points, usually three very well defined, my tasks for the day, morning, or afternoon. Research shows that time spent outlining and visualizing what you need to get done yields extremely high productivity and efficiency. In fact, research shows that your time exercising is more than paid back through the resulting productivity and efficiency. So it is a bonus that you actually get time back when you take time to exercise. Lastly, I spend time troubleshooting whatever the biggest problem, issue, or event that I have upcoming. Believe me, as a lawyer I have plenty of these issues to think about and contemplate. Again, research shows that exercise yields creativity for problem-solving. In fact, as soon as my workout is over I need to immediately write down some of the notes of all of the great ideas that I have generated during my workout. Doing the above mental routine, I many times swim longer than I had planned due to being so engrossed in the mental aspects and my thoughts. The same goes for running or biking. I really believe, and research supports, that if you use your training time to positively influence your brain and thought processes you can have greater successes in all aspects of your life. Once you make this sort of simple mental routine a habit it is like putting a turbocharger on your brain and will make the rest of your life better as well. Wow – times flies! 18 years and 11 months ago (to the exact date of the race eve) our first child was born. Holding the precious baby with tears in my eyes I did what all parents do – wonder about the future. Would we be adequate parents? How would she turn out? Will she want to run . . . with me? And, I will be an old dad . . . how will that work out? You know, all the important stuff. Now, away at college our little Annecy, oldest of three, is doing great in all aspects. She is thriving academically, socially, spiritually, and in extracurriculars. And, she continued her running just for fun and fitness. With ongoing diligence she pronounced that she wanted to run a marathon. Would I do it with her? Are you kidding – for a fitness-a-holic like me it is one of those dreams of a lifetime! The old man running a marathon with his daughter. So, we did it! We ran the Newport News One City Marathon on March 4th. It was my first trip there and it was a fantastic venue and race. We ran it (sort of) together . . . she dropped me during the second half and I couldn’t have been more proud seeing her fade away in distance in front of me. Once reunited at the finish line it was all joy. A friend sent me a beautiful e-mail after the race that included “Our accomplishments are actually larger than our individual performances. Through our example, we have put dreams in motion for our next generation by showing them how to chase goals and all the possibilities in life that are attainable (with a little hard work, of course).” I cried, again, 18 years and 11 months later. We all put dreams in motion with our daily actions and example. Example is every day, every day, every day. Consistent execution over time. It is hard and takes a long time, but the payoff is priceless. Be the example you want the next generation to follow – they are watching. Whoosh . . . .blows the wind across the island as the great Hawaiian warrior blows in the conch shell horn calling all athletes to the theme of Kupa’a. Kupa’a was the theme for the 2016 Hawaii Ironman™ World Triathlon Championship. Presented in lu’au style by Island Breeze dramatizing the theme Kupa’a which means steadfast, firm, and immovable. Through music, drama, dance, and fire these honorable values of the Hawaiian culture were presented to us. These character strengths are in emblematic of the ancient Hawaiian people and also of Ironman™ competitors in their pursuit of the finish line on race day. The theme of Kupa’a applies to all of us and all aspects of our lives. Focusing on our families, faith, fitness, and profession in a steadfast, firm, and immovable manner allows us to stay true to our values and our long-term successes. Kupa’a is very similar to our long-time theme on this blog of consistent execution over time toward a worthy goal, always produces positive results. Times will get tough and there will be lots of hard work. Yet, like the Hawaiian warrior, or the Ironman on race day, if we remain steadfast, firm, and immovable we will persevere with positive results. Whoosh . . . as the wind again blows across the island in the wish and prayer for all competitors to take the spirit of Kupa’a home to their families and communities far away, and to remain steadfast, firm, and immovable. We all know that riding the bicycle is probably the biggest risk we take as triathletes. Accordingly, t is incumbent on all of us to help raise awareness of the dangers and be a good ambassador for the cycling community. We just published an e-book with the updated North Carolina bicycle safety laws you can get free here. Please join me to help spread the word and encourage bicycle safety. First, know the rules of the road and follow them. In North Carolina the rules of the road have recently been updated and I believe they are very helpful for cyclists. Please learn the rules and follow them. Next, be visible. Twice in the past week I have been stopped by motorists and thanked for having daytime riding lights to enhance my visibility. One elderly man commented that although he tries to be very mindful of cyclists he has a hard time seeing us. He specifically mentioned the difficulty seeing us as we go in and out of shadows on those beautiful back roads that we love riding on. My tail lights really helped him, and clearly helped me too! Lastly, please be a good ambassador out on the road. Your actions affect the safety of all of us on the road. Most drivers are unaware of bicycle safety laws so it is important that we all help spread information and treat motors with respect out on the road. Remember to review the e-book and help spread the word!! Knowing the laws, being visible, and being a good ambassador will help keep us all safer on the road. “Faith without works is dead…” Of course, this passage applies to all aspects of our lives including training and racing. Consistent execution over time is the work that backs up our faith. 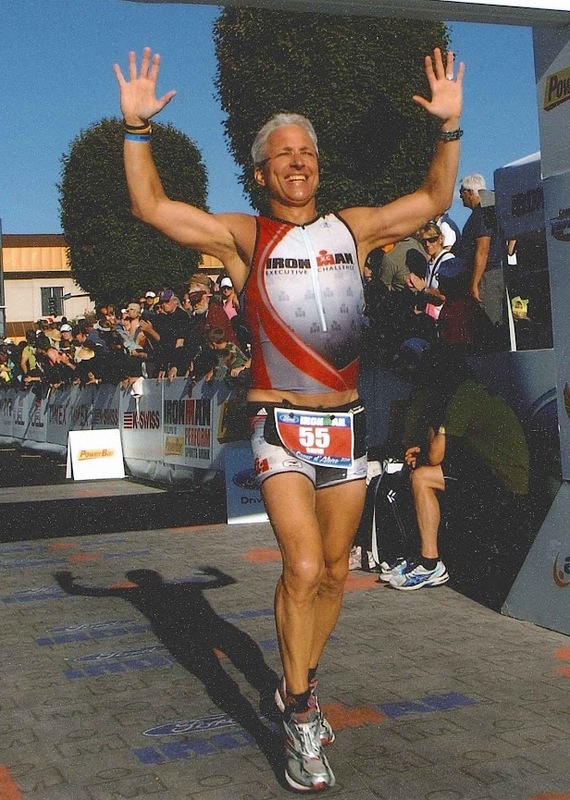 Entering my 36th consecutive year of racing triathlons I set one goal – qualify for the 70.3 world championships which is back in the United States this year. Due to three teenagers and a myriad of family obligations, there was only one qualifying race that would fit the schedule. Although quite early in the year for me, Ironman™ 70.3 Puerto Rico would have to be it. Unfortunately, I would have to make the trip on my own due to family obligations back home. Accordingly, this race was “all business” . . . give it all I’ve got to qualify for the world championship. I had faith that I could peak my many years of fitness with a chance of delivering big time on race day. The only way to guarantee the spot was to win. This day was going to start out full blast from the cannon. Laser focused, I went to the lead on the swim and was able to hold position through the swim exit. With a transition close to one‑third of a mile long, I knew that a smooth fast transition would gain a little time. The wind, heat, and humidity made itself known on the bike. The conditions were rough, but I also knew that it was an opportunity to widen the gap by a few more precious minutes. The pedal was to the metal for the full 56 miles. A second smooth and fast transition allowed me to gain a few more precious seconds heading out onto the run. The run course in Puerto Rico may be among the most difficult on the circuit including short and very steep climbs, historic cobblestones, and the legendary “microwave” on the back side of the fort wall with no aid stations. This was going to hurt! Hanging on by a thread it was exciting to cross the finish line, cameras in my face, believing that I had taken the race wire to wire for the win. My beliefs were later confirmed by friends on computers that I had for the first time come in first place in my age group amongst an international field at an Ironman™ branded race. Races, like any achievements in life, are not one‑day wonders. They are the cumulative effect of efforts over time. Keep the faith, and the faith is that consistent execution over time always produces favorable results. Leadership behavior always trickles down through organizations and constituencies. The behavior is reflected in our businesses, religious organizations, schools, families, and communities. Good or bad, behavior usually reflects leadership. Today is Election Day and after I stood in line and cast my vote I was brought to tears. Some of our choices were no-win situations. The level of ongoing acrimony, and the predictions of that behavior continuing, saddens me. Research shows that this acrimony trickles down through society and is even reflected in school-aged youngsters and toddlers. Further, as we go down the socio-economic and educational ladder, the acrimony that is modeled is carried out in an increasingly rude and rough manner . . . sometimes even through violent behavior. The sad part is it is all reflective of leadership. TV news networks can’t even put members of the opposing parties in the same room. The result is not news, but childish banter and talking over each other. They even call each other names! The networks should be ashamed for perpetuating an environment where this behavior fosters. We all deserve better. Our children deserve better. Our future deserves better. Unfortunately, it appears that our political acrimony will continue. Until we all demand better it is bound to continue. Decency and respect are timeless principles. In today’s world it is refreshing when we stumble across environments that reflect these values. Although trickle-down is usually more influential and powerful than trickle-up, perhaps the only way we can influence and change our political structure is if each of us, one at a time, business by business, school by school, religious organization by religious organization, and so on, adopt, instill, and demand environments of decency and respect. My sadness with the realization of the poor choices for leadership in our election process was lifted by the optimism of the young people I encountered throughout the morning, including my own children. They understand and value decency and respect. They can, will, and must change the world; and they need our support and leadership. Let’s join together and begin a movement of trickle-up decency and respect. Together we can make that voice louder and stronger than the acrimonious lies, name calling, and bashing of this past political season. We deserve better. The steeple of Mokuaikaua Church stands proudly over Kailua Bay. Mokuaikaua is the first Christian church in the State of Hawaii and Kailua Bay is where the legendary and world-famous Hawaii Ironman™ World Championship begins. This past Sunday it was fun to visit Mokuaikaua Church, and see Kahu (Pastor) David who saw me and exclaimed “David, you’re back!” Kahu David’s special welcome really set the tone for my return to the Big Island. Kahu David started with a story of hope to assurance led by faith featuring Noah and references from Genesis and Hebrews. He continued that it all starts with a belief, then a vision, and ultimately takes action. Those of us with Faith, or even those of us searching for Faith, see the metaphor to and from Ironman™ racing very clearly. In religion, as in life, as in Ironman™ racing, you have to believe in the journey and the path that you are on. The belief is the first step in any transformation toward a goal. You have to believe and have faith in that belief. Out of the belief you have to create a vision. “Can you see the vision,” Kahu David asked. “You must actually see it and follow it.” For Noah it was seeing what God had in store for him. For competitors on race day it’s actually seeing the swimming, biking, running and getting to the finish line. Believe it, and then really see it in your mind’s eye. We’ve discussed it here many times before. Action is the key limiter for most people. You have to believe it, see it, and then you must take action to do it or it is all good for nothing. Belief and vision frames it and is the guide, but action will carry you to obtain the goal and win the day. We are less than a week away from the Ironman™ World Championship. We have to believe, then have the vision to actually see it, and we all know that on race day it is the action that will carry us to the finish line. How do we do it all? How do we make sense of everything? It seems that this is a crazy world that we live in. And, I’m not just talking about politics which seems to repeat itself every 4 (or even 2) years, but everything around us. We are all busy, busy, busy. In fact, many of us are so busy that we forget what we are even doing. It can make your head spin. Then, we have to deal with all of this never ending technology. Interestingly, with all of the “benefits” and “efficiencies” of technology it seems that we work harder, the 8‑hour day has blurred into 24/7, while at the same time real wages have not increased and it is documented that we all deal with more stress. What do we do next, and how do we keep up? On top of all of that we have family and social pressures that are a constant challenge for all of us. Then, we have our spiritual life and pursuing our faith these days seems more complicated too. All of the above seems to be get woven into our professional life, which dials up the stress even more. Fitness should be important to all of us, but with everything else going on how in the world do we incorporate a healthy fitness lifestyle? It was my struggle with all of these aspects of life, particularly after getting married and having our first child, which caused me to reflect and start developing The Four Anchors. The finding, reviewing, and pursuing life through the filter of The Four Anchors makes everything fit together better, gives us a system to organize our lives, and helps to give our lives much more meaning. Using the anchors as a template for goals and decision making simplifies our daily actions and makes life easier and more meaningful to handle. Using and applying The Four Anchors on a consistent, daily basis provides a foundational structure for everything we do. Suddenly, time begins to expand, we perform at higher levels, are happier, and are well on the road to a lifetime of fulfillment and satisfaction. This system has been very helpful to me and I hope it is useful for you. The principles contained in The Four Anchors are the reason I started this blog almost a decade ago. Remember, most writers are writing to themselves first. That is certainly true for me. Now, more than 300 articles later, the goals and path remains the same, although the pursuit continues. Thank you for joining me along the way. It seems to happen in every aspect of life. We see bright, talented people underperform. It happens in business, marriages, athletically, and even spiritually. What is the cause of this? Perhaps it boils down to not having a system to make outcomes a matter of choice rather than chance. In other words the failure to plan and execute. The perfect example of this is an Ironman competitor on race day. Do you ever shake your head and wonder when you see a well-trained athlete really blow it on race day? I’m not talking about having good days or bad days which happens to all of us in competition. Rather, I’m referring to the failure to plan and execute when you should know better. For example, nutrition and hydration. This is easily practiced and then executed on race day. Of course athletics is just a metaphor for us for all aspects of life. One of my favorite authors and lecturers is Harvard business professor Clayton Christianson. He says, in business, and also in life, you can either take a crap shoot or follow tested reliable theories. Why leave it to chance – tested reliable theories don’t lie, they work. Learn the theory and execute it for predicted and reliable results. The Four Anchors is a system to plan and execute the important aspects of your life. It is a strategic formula and path to a life of satisfaction and fulfillment. This isn’t hard . . . in fact it makes it easier. When we follow a tried and true system based on reliable theories, the positive outcome is then very predictable. 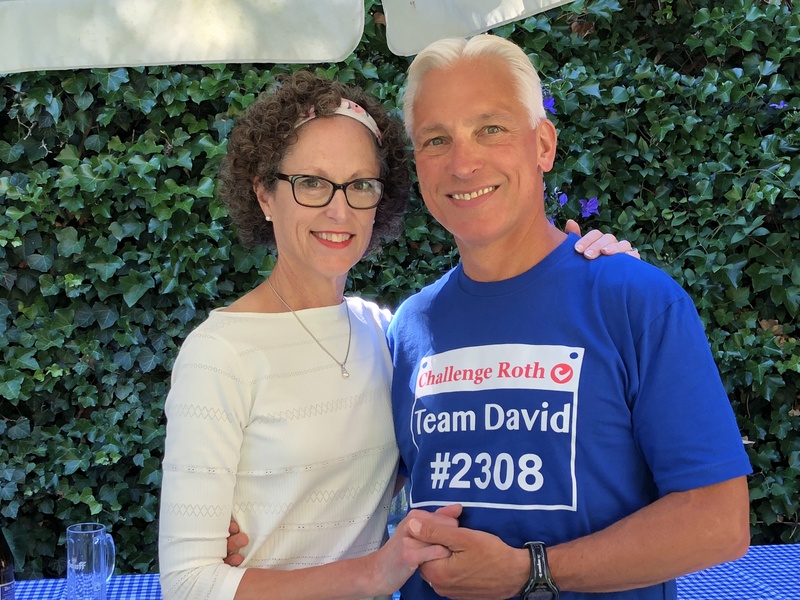 Challenge Roth is an epic event. It is the largest, long-distance race in the world. The small village in Northern Bavaria hosts 5,000 athletes and attracts approximately 250,000 spectators. One of the highlights of the course, in the entire triathlon world, is the hill at Solar, which is legendary for its tens of thousands of spectators packing the narrow road to encourage the athletes biking on the clock. It is epic! Epic challenges are exciting and keep us motivated. They challenge us, stretch us, and help us to grow. Of course, the challenge does not have to be an iron distance triathlon, just something a little beyond our typical comfort zone, or an event we look forward to with great anticipation. Occasional epic challenges keep us motivated as we go through our daily responsibilities and activities. It gives us something to look forward to with great anticipation and excitement. It gets our blood flowing, and our mind focused. Epic challenges allow us to build on our passions and focus on our ordinary pursuits with increased focus and determination. Further, they allow us to reset our goals and our commitment to strive even higher. Post challenge we tend to make a higher level of performance our new normal. I have a personal theory of relativity, which basically asserts that an epic challenge makes other challenges in front of us relatively easier and more manageable to handle. It helps keep things in perspective and makes life’s bumps in the road easier to handle. Even my homestay host are “epic!” This will be my seventh time with his German speaking homestay family whom I first met at the race in 1989. The Family Reinel were the town bakers, and although now retired, Lotte and Dieter warmly welcome their American “son.” It has been an amazing friendship for more than 25 years. Although we speak little of each other’s language it doesn’t seem to be a barrier. We communicate through love and smiles! It’s epic! Seek out an epic challenge to lift you, build you, and make you better. I can’t wait for Challenge Roth next week … it will be epic! “It’s the greatest virtue,” she explained at her last public presentation. “Nothing else matters if you can’t hang in there when the going gets tough.” It was a pleasure to hear the great Maya Angelou giving her very last public speech just prior to her death several years ago. “Never Give Up” applies to all aspects of life and it was a great honor and pleasure to hear Maya Angelou eloquently and poetically describe just how valuable that trait is. Life is a continuing series of challenges. Everything we do, everywhere we go, and every task we undertake has challenges. The question is how do we react when presented with challenges and particularly when it gets very difficult. It’s easy to keep going when things are easy, but when it gets tough most people avoid the suffering. Of course challenges are tough … they are supposed to be! It is the meeting and surviving challenges that ultimately provides us with fulfillment and satisfaction. The very basics of our own self-worth and self-esteem are based on the fact that it must be earned. We earn it by facing and overcoming challenges. By “hanging in there when the going gets tough” we earn an internal gratification and satisfaction that strengthens our own self-worth and self-esteem. All great accomplishments are challenges. As Maya Angelou implored us, “The courage to just keep going” is what separates the individuals who achieve from those who simply drift along. Steve Jobs, the founder and president of Apple, was once asked for the greatest piece of advice in building a successful company. He answered in part, you have to have passion because it is so hard that any rational person would give up. Further, working hard over a sustained period of time beats most people because they give up. Persevering when it is really tough is what separates those who achieve and excel. Recognize that the greatest virtue is to have the courage to keep going when things get tough. Like an Ironman on race day, never give up, never give up, never give up! Do you have it or not? If not, you better figure out how to get it. If you do, you must continue to nurture it and develop it. Willpower reveals the strength of your character. Whether you call it willpower, or persistence, determination, tenacity, drive, or a host of other descriptors, it is probably the most important trait to develop on the road to success of satisfaction and fulfillment. Willpower is just like a muscle. The more you exercise it, the stronger it gets. Willpower isn’t some glamorous one‑time accomplishment, but rather the daily discipline that leads to long term accomplishment. Resisting temptation is a main ingredient to developing willpower. It may be foregoing a dessert, or resisting to hit the snooze button on the alarm. Don’t sacrifice the glory of the future for the pleasure of the moment. In fact, turn it around and relish the success and pleasure of the future as opposed to the temporal passing momentary sacrifice. The ability to exercise self-control on an ongoing basis over the long term is what separates those who succeed and those who utter the worst of words “what might have been…” Self-control is a building block of willpower that always pays dividends. Choosing worthwhile goals can help keep us on track with our willpower. In fact, success in life in large part is determined by the pursuit of worthwhile goals. Or course, this spills over into all areas of our lives including fitness, profession, family, and spiritual aspects. The good news is that the discipline of willpower is a habit that can be developed and that becomes self-perpetuating. Once we set our worthy goals, just like an Ironman on race day, we just keep putting one foot in front of the other no matter how difficult or how tough with our eyes focused on the goal.